Steve Martin, Eddie Murphy, Heather Graham, Christine Baranski, Jamie Kennedy, http://www.dvdmg.com/cgi-bin/search/search.pl?Terms=Robert Downey Jr." class="roll3">Robert Downey Jr.
Of all genres, I don't think any depends on talented performers as heavily as comedies. Strong scripts or skilled directors can make virtually every other kind of production overcome mediocre acting, but not comedy. If the performances fall flat, the program will fail virtually every time. Conversely, this emphasis on acting talent benefits lackluster material. I can't count the number of times I've watched movies or TV shows that offer little wit or spark in any way other than the performers but still came to love those pieces. Great comedic talent can't always save poor material, but it can make those works much more entertaining than they should be. 1999’s Bowfinger is a film blessed with both good material and a fine cast, but I think it's the acting that takes the movie to another level. To be sure, Steve Martin's script is clever and funny, but the lines themselves aren't enough to make this movie go; it's the acting, particularly a stunning performance from Eddie Murphy. Bobby Bowfinger (Martin) tries his hardest to become a Hollywood big shot, but he fails every time. He thinks his pal Afrim’s (Adam Alexi-Malle) script for Chubby Rain will be a hit but he can’t get the financing to make it work. Successful producer Jerry Renfro (Robert Downey Jr.) tells Bowfinger he’ll finance Chubby Rain under one condition: Bobby can recruit superstar Kit Ramsey (Murphy) as the lead. That seems to be an impossible task, but Bowfinger comes up with a stroke of apparent genius: he’ll surreptitiously film Ramsey and integrate that footage into the rest of the movie. We watch Bobby’s crazy quest, one that gets even nuttier when he recruits a Kit doppelganger named Jiff (Murphy again) for long shots. I saw Bowfinger during its theatrical run and liked it but didn't feel dazzled by it. By that point in my life, I should’ve known how meaningless many of my initial reactions could be; lots of my favorite films didn't do much for me that first time, and comedies are at the forefront of that fact. Still, though I should have known better, Bowfinger wasn't a film I planned to see again. Nonetheless, I decided to give the DVD a look, and I’m glad I did. On second glance, Bowfinger more fully revealed its charms. Most of this positive sentiment stems from Murphy's fantastic dual performance as superstar Kit Ramsey and likable goof Jiff. Kit's really an exaggerated version of Murphy himself, with his excessive ways and his entourage, and Murphy seems to greatly enjoy this form of self-parody. Kit didn't make that great an impression the first time around, but upon second viewing, I found the character fascinating and absolutely hilarious. Murphy invests the character with such over-the-top emotion that he's constantly entertaining and uproarious. On the other hand, Jiffs is much more laid-back and lovable, and Murphy's equally hilarious in this role. At times it's hard to believe the same actor played both parts because everything about them is so totally different. Even though Jiff obviously looks just like Kit, they barely seem to resemble each other. This doesn't happen because of makeup that changes one's appearance; it's all in the attitudes with which Murphy endows the characters. I look forward to watching Bowfinger many times over just to delight in all the nuances Murphy brings to the parts. The best performance of his career? Yeah, I think so. Steve Martin largely plays the straight man in the film, though he's not really put in that kind of dry position; he certainly gets quite a lot of strong material himself. However, I just was so bowled over with Murphy that Martin seemed to get put into the background to a degree. Of course, now that I've said that, I'll probably change my mind next time I watch the movie, but that's how I feel right now. Anyway, Martin is thoroughly terrific as the title character. He makes Bowfinger vaguely likable but doesn't overexert himself to endear the guy to the audience. Bowfinger's a cartoon of a Hollywood wannabe, and while his ruthlessness seems generally inept, he shouldn't seem too sympathetic to the audience. He doesn't, but we're still happy when he makes it at the end. The remainder of the cast is also quite strong. Heather Graham displays a fine aptitude for comedy here. After her stiff and flat performance in Austin Powers: The Spy Who Shagged Me, I began to doubt that she had any flair for comedic material. However, Graham dispels that notion with her deft and witty performance as the stereotypically manipulative actress Daisy. Frank Oz is not and never will be a great director, but he knows enough to stage some more-than-competently made films. When he has great talent – as he does here, or in Dirty Rotten Scoundrels and What About Bob? - he can produce good films, but he's inconsistent. Pictures like Housesitter and In and Out were mediocre at best, despite some strong actors. For whatever reason, Oz did seem to bring out the best in his cast here, and as such, Bowfinger is a keeper. 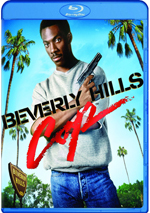 Bowfinger appears in an aspect ratio of approximately 1.85:1 on this single-sided, double-layered DVD; the image has been enhanced for 16X9 televisions. While parts of the movie looked fine, too many problems came along for the ride. For the most part, sharpness was good. I noticed mild edge enhancement through the film, and some shots tended to be a little iffy. However, most of the flick showed solid delineation. No issues with jagged edges or moiré effects occurred, but source flaws were surprisingly prominent. Given that the DVD debuted about five months after the flick hit the big screen, I’d expect a clean presentation. Unfortunately, quite a few examples of marks, specks, nicks and spots appeared. These weren’t heavy, but they created a lot more distractions than I anticipated. Colors usually appeared positive. The movie went with a warm, natural palette that mostly satisfied. On a few occasions, I thought the hues became a bit too intense, but the colors generally looked nice. Blacks were reasonably dark and deep, and shadows tended to be acceptably clear, though a few shots were somewhat dense. The inconsistent elements combined with the print flaws made this a “C” presentation. While not an ambitious mix, the 5.1 audio of Bowfinger suited the film quite nicely. Both Dolby Digital 5.1 and DTS 5.1 tracks appeared on this DVD. I flipped between them as I watched the movie and also rewatched many segments to attempt to detect a difference. What'd I hear? Not much discrepancy. In fact, the only noticeable difference stemmed from the fact that the DTS track was decidedly louder than the Dolby mix; eliminate that factor and I think the two would sound virtually identical. Bowfinger boasted a fairly decent front soundstage and created an overall three-dimensional ambience that's quite good. This wasn't Saving Private Ryan, so there's little bombast, but the mix utilized the five discrete channels well and provided a pretty realistic atmosphere. The best scenes were those such as the one in which Jiff had to cross the crowded highway; traffic noises whizzed past you effectively. The quality of the audio seemed fine. Although I occasionally noticed a slightly harsh edge to the speech, dialogue seemed clear and natural; I must note that sometimes speech did appear to get a little lost in the mix, though not with great frequency. Music seemed a little trebly but featured some strong bass and appeared generally well-reproduced. Ironically, effects were probably the most consistently strong aspect of the audio; these always appeared realistic and provided a surprising impact. Bowfinger won't win any awards for sound design, but it's a perfectly competent complement to the onscreen action. When we head to the set’s extras, we open with an audio commentary from director Frank Oz. He offers a running, screen-specific chat that looks at story issues and editing, sets and locations, cast and performances, set design and cinematography, and a few other topics. When I first listened to this track back in early 2000, I didn’t care for it. Maybe I’ve just heard more than my fair share of truly crummy commentaries over the last 15 years, but now I can’t figure out why I disliked Oz’s chat. Sure, he indulges in some of the usual happy talk, but he also gives us many nice insights into the production. I especially like his notes about cut scenes and improvised bits. This turns into a generally satisfying discussion. Next up is a 23-minute promotional documentary about the film called Spotlight On Location. As with many studio-produced pieces, this one largely serves to tell us how terrific the movie is. It offers interview snippets from all the main actors and Oz and intercuts these with film scenes and some on-the-set shots. “Spotlight” lacks any kind of real "making of..." emphasis and reveals very little about the creative processes behind the film. Still, it's pleasant and entertaining and seems to be a more substantial piece than most of these featurettes; it ain't great, but it's worth a watch. Two deleted scenes fill about five and a half minutes. One offers an alternate version of the bit in which Bowfinger tells his friends about the project, and the other is an unused piece in which Bowfinger searches for Kit's address. The latter is pretty funny, actually, and the former is good but a bit lengthy. Oz refers to many other deleted scenes in his commentary, so it's strange this is all we find. Nonetheless, I enjoyed being able to see them. The DVD also contains about three minutes of outtakes. I despise the usual "Whoops! I blew my line! Ha ha ha!" outtakes that dominate this genre, but these were better than most. That's because mixed in with the goofs are some unused takes of scenes that are quite amusing; Murphy tosses in a line to describe Jiff's "encounter" with Daisy that's absolutely hilarious – and one I plan to steal for my own use, thank you very much! As such, these outtakes are much more entertaining than most. We also find many promos. Not only does the DVD include the trialer for Bowfinger, but also get ads for The Hurricane (in the "Universal Showcase" section) plus clips for Liar Liar, The Nutty Professor, and EdTV (all in the "Recommendations" area). Finally, the DVD features mediocre biographies for six of the actors and for Oz, and there are production notes on the disc as well; I found those to be mildly interesting but not more than that. 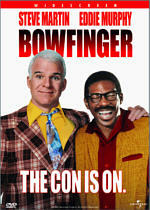 We’ve seen plenty of Hollywood parodies over the years, but few amuse as well as Bowfinger. It doesn’t reinvent any wheels, but it uses excellent performances from a terrific cast to turn into a consistently enjoyable flick. The DVD suffers from erratic picture quality but comes with pretty good audio and supplements highlighted by a good commentary and some fun cut footage. This never turns into a terrific release, but the movie is so memorable that it still earns my recommendation.